We like to think of making the move into a Senior Living community as an exciting step of a journey that may aid in the comfort, longevity, health, and quality of life for senior adults. However, we understand that taking those first steps into the journey may be daunting and overwhelming at times. Whether you are looking for a new home for yourself or your loved ones, there are many factors to take into account when making the move to senior living. In hopes of aiding you in your journey, we’ve created tools and a list of recommended resources to focus your research into senior living options in a productive and easy way. If you are just starting your search for senior living options for yourself or a loved one please visit our Where to Begin page for more information on the initial steps and questions that need to be asked as you begin your journey. 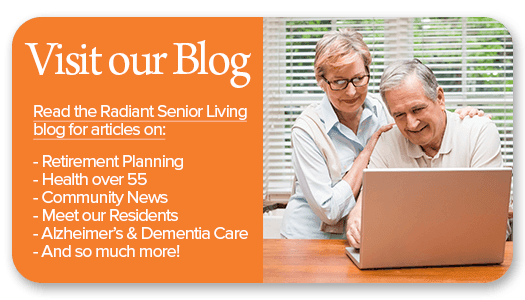 Our Radiant Blog features a variety of topics that include tips for caregivers, news about our communities, articles about senior health and more. We hope that you find that with the aid of these guides and the following recommended resource sites make the move into a senior living community as enjoyable and stress-free as possible. Family Caregiver Alliance — Great resource for caregivers that includes a tool to find your caregiving situation, connect you with other caregivers and provides caregiver education. National Association of Area Agencies on Aging — Use this site to find local Area Agencies on Aging. AAAs provide support and information to aging adults and caregivers. All AAAs offer core services that include elder rights, supportive services, health & wellness, nutrition, and caregiver education and assistance. Alz.Org Caregiver Center — Caregiving resources for caregivers of individuals experiencing the symptoms of Alzheimer’s and other related dementias. Alzheimer’s Association — The Alzheimer’s Association is a voluntary health organization in Alzheimer’s care, support and research. The Alzheimer’s Association website provides information on dementia and Alzheimer’s as well as resources for local support. National Institute on Aging Alzheimer’s Disease Education and Referral Center — The NIA’s Alzheimer’s Education and Referral Center provides caregivers and health providers with information, tips, and tools for addressing the symptoms of Alzheimer’s. Eldercare.Gov — Eldercare Locator is a public service of the United States Administration on Aging that connects you to services for alder adults and their families. Assisted Living Federation of America Consumer Corner — Explore information on Assisted Living and plan for Assisted Living costs at the ALFA.Org consumer resource corner. Senior Care Calculator — While each senior care community offers different pricing, accommodations and care services, it is nice to get a picture of the average costs of senior living. We recommend contacting communities of interest directly for their costs and what the costs cover at the community. However, this Senior Care Calculator from A Place for Mom may help you in preparing for senior living costs. Benefits.Gov — Government resource that allows you to find out which government benefits you may be eligible to receive. Medicaid.Gov — The Medicaid.Gov website has a tool to see if you qualify for Medicaid benefits to help pay for medical costs. Medicare.Gov —Website that delves into the federal health system designed for those 65 years and older. The Medicare.Gov website includes a list of services, eligibility tools, and more. How to Pay for Senior Care with Life Insurance —article featured on A Place for Mom which covers payment options using life insurance benefits in an easy to read question and answer format. National Institute of Health: Senior Health — Website built with older adults in mind. NIHSeniorHealth.Gov gives information about senior health topics in a way that is both easy to navigate and understand. Meals on Wheels America — Meals on Wheels is a national organization that is a community-based senior nutrition program dedicated to addressing senior hunger and isolation. The national site gives more information about the program and allows you to search for local chapters to set up needed food delivery. AARP — The American Association of Retired Persons provides information on topics relative to senior health, travel, lifestyle, entertainment, news and more. U.S. Department of Veterans Affairs Geriatrics and Extended Care — Learn about the medical benefits and long term care services available for United States Veterans.